Sean Hurwitz photo by Michael Hacala. Israeli-born guitarist Sean Hurwitz has played amongst the big leagues in the music world. He’s toured with Enrique Iglesias and Smash Mouth, and played with Gin Blossoms, Anna Nalick, Chris Wallace, Judith Hill, just to name a few. When he’s not on the road, he’s hard at work recording, writing, and producing for music and film. Technical mastery and keen precision to detail make up his trademark skills on and off stage. Sean took time to chat with us about his guitar gear, collaborating with other artists, and how he spends his time off tour. Sean: When I was (really) young, I studied some keys. Then when I was 11, I asked my parents to teach me some guitar chords…which I practiced for a day or two and then stopped because my fingers hurt (laughs). When I was 13, I finally took it seriously and never looked back. Sean: Well, to be frank, it has become my job by now. It is STILL something I LOVE doing! Every day! I would never stop. But these days I’m a business man, and this is one of my businesses. Thankfully I get to really enjoy my job every day, but of course, it’s always got it’s ups and downs. I still wouldn’t change it for anything. What was it like leaving your home country to move to the US? Sean: Moving to the US is something I always wanted to do. Since my parents are both from NY, my brothers and I are lucky enough to have American passports. So, I always wanted to try my luck here as a musician. Don’t get me wrong, it was still really scary to move across the world to a place I’d never been to (LA) and start from scratch. But, what’s the saying? If you don’t try, you’ll never know. And, I needed to know. Being away from my family isn’t easy, but these days, with tech and all...it’s so much easier to be in touch every day. 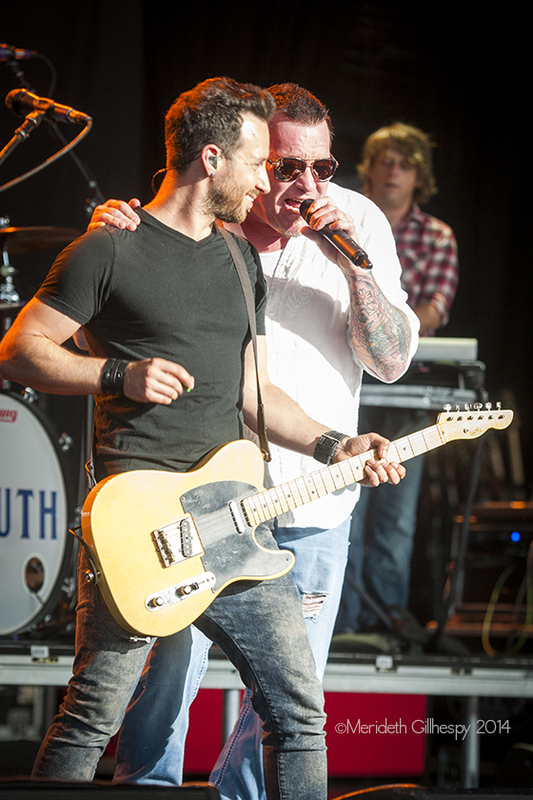 Sean Hurwitz performs with Smash Mouth. Photo by Meredeth Gilhespy. What are some challenges as a guitar player that you face on tour and in the studio? Sean: Haha, well…that’s an easy one for the studio. You see, when I’m home, I’m in the studio…every day! And the biggest challenge I have always faced is software. Any engineers reading this will relate! Sometimes you upgrade this or that and suddenly there are anywhere between 1 to 10 issues that screw up your work flow. It could take 5 minutes to fix, or you could be researching the problem for the rest of the day. I hate that, but fixing stuff is all part of being an engineer. So it is frustrating, but I rarely let it get to me. On the road, it’s the airport security checkpoints. It’s a frustrating necessity. Sometimes we’ll go through 3-4 of them in one day. Again, no complaints, but it’s just frustrating when you travel ALL the time. I wish we could have a world wide TSA PRE program where you are pre-scanned and questioned. What is the creative process like collaborating with different artists? The creative process is different from artist to artist. Every artist likes to be more in control of this and less in control of that. Some artists want you to play it ‘exactly like this’ while others couldn’t care less how you play it as long as it sounds cool and that you’re having a blast while you are doing it. So, it’s very personal. One of the keys to my success so far has been adapting. I am a chameleon, whatever the artist needs, that’s what I’ll be (that’s what I get paid to do)…as long as it’s within my range of comfort. As an example, I don’t drink alcohol and I won’t drink some just because an artist will feel better if I do. If that’s a make or break, as much as I appreciate the opportunity, I’ll probably skip it…but not before I try to get around the issue. That being said, this has never been an issue for me. All artists I’ve worked with respect me being sober. Sean Hurwitz and Enrique Iglesias perform in Israel. Photo by Keter Lior. How did you get to become the guitar player for superstar acts like Enrique Iglesias and Smash Mouth? Sean: Well, first, you make superstar friends. My dear friend and incredible drummer, Randy Cooke, was playing for Smash Mouth in 2011 (he’s actually still with them) and he called me when the original guitarist and incredible song writer Greg Camp left back then. I came in to sub for him and ended up with the band for a while. Greg actually is back with the band now, no doubt writing more of those hits! While I was in Smash Mouth, I met superstar Audio Engineer Eddie Caipo. He was impressed by my work ethic and attention to detail (in music and audio) and always told me he’d happily recommend me for any gig, which is great to hear, because I’m always looking to play with new musicians/artists/bands. Years later, when lead guitarist for Enrique, Emmett O’Malley had moved on, an opportunity opened up for the band to recommend replacement guitarists for auditions. I was the lucky one who got the gig. I understand that you are also a producer. Can you tell me about your experiences producing for other artists? Sean: I love producing. Although these days, I produce mostly for TV and Film. Just me, myself, and I in the studio all day. But to answer your question, I still produce for artists here and there and I love it. It’s so great to click with a person and give them more than they asked for. I produced an artist a few years back, Jeff West. Great writer, great singer! What a wonderful compliment, right? Anyway, that’s what I love about working with artists. I love making their visions/dreams come true. How do you spend your time off tour? Sean: On a business level, when I’m off tour, I am in the studio working. I am meeting up with old friends and new friends. I am looking for new investments, be it Real Estate or other investment opportunities. On a personal level, I hang out with my gorgeous wife (who deserves special quality time for letting me be out on the road so much). I hang out with our dog Bran and our cat Monster (we didn’t name him that). My wife and I LOVE to cook so when I’m home, I do a lot of the cooking. Those who know me know I love to smoke meat and grill a lot. I WANT to love working out, but it’s always a struggle (laughs). That’s about it, work, date nights, quality time with family and friends. Sean Hurwitz photo by Alan Cortes. What is your favorite guitar and gear to bring on tour and in the studio? Why? Sean: Well, it depends for what purpose, but the most important things for me are tone and dependability. When I pick up a guitar it better sound GREAT and be 150% dependable. So my main few guitars are (any) Shabat Guitars, Eastman Steel Strings (for studio), Maton Steel Strings (for live) and Merida Guitars for Nylon String. Like I said, great tones and GREAT construction. I like a well built guitar that holds together on tour and when it’s crunch time. Are you working on any upcoming music projects? Sean: Honestly when I get back home, my main focus for the year is to hit my goal of 200 songs a year for TV and Film. It’s a HEFTY goal but that’s what I’m shooting for. Also waiting for my call from Foo Fighters to come play with them (laughs), a man can dream! Wouldn’t that be amazing?